Lower center, on the log: "F.Boucher 1748"
A young man with a flute gazes languidly at his companion, a rosy-cheeked, barefoot woman dressed in red silk who returns his gaze longingly. Another youth offers a shell full of fresh water to a dainty maiden in a diaphanous gown of purple-gold and red satin. These amorous couples, accompanied by young children frolicking with goats, appear in an idyllic setting of lush, green, leafy trees under a pale blue sky with gray-pink clouds. The Fountain of Love, dated 1748, originally served as a finished cartoon for a tapestry, one of a series of six known as the Noble Pastorales. Beginning in 1755, the Beauvais tapestry manufactory wove the tapestries directly over the cartoons. Eventually, the cartoons were cut up into sections and sold separately. Some of the tapestries survive, and their extended compositions reveal that the cartoons were originally even larger. Beauvais Manufactory, French, founded 1664 (Beauvais, France), possibly sold, 1829. Source: Standen, Edith A. "Some Notes on the Cartoons Used at the Gobelins and Beauvais Tapestry Manufactories in the Eighteenth Century." The J. Paul Getty Museum Journal 4 (1977), p. 27. Source: Photographed in 1902 at Brook House, London, for Country Life. Captain Jefferson Davis Cohn (Paris, France), sold to Jack Herbert Michelham. Source: Duveen records, GRI, Box 440, F-2; Duveen records, GRI, Box 440, F-1; Burke's Peerage. Jack Herbert Michelham, born 1903, sold, possibly through Jefferson Davis Cohn (Paris, France), to Duveen Brothers, Inc., 1934. Duveen Brothers, Inc. (London, England; New York, New York), sold to Anna Thomson Dodge, 1935. Anna Thomson Dodge, American, born Scotland, 1871 - 1970 (Detroit, Michigan), upon her death, held in trust by the estate. Burty, Philippe. "Vente de tableaux a londres." Gazette des Beaux-Arts 7 (July 1860), p. 315. "Picture Sales." The Art-Journal 6 (1860), p. 247. "Revue des ventes publiques: Ville de Londres." Moniteur des Arts: revue permanente des expositions et des ventes publiques 3, no. 108 (1860). Christie, Manson & Woods, London. Catalogue of the Very Celebrated Pair of Portraits by Rembrandt... and of Two Noble Chef-d'oeuvres by Boucher [...]. June 30, 1860, p. 4, lot. 25. Nolhac, Pierre de. François Boucher: Premier peintre du roi, 1703-1770 (Paris: Goupil, 1907), p. 63, ill. facing p. 64. Macfall, Haldane. Boucher: The Man, His Times, His Art, and His Significance (London: The Connoisseur, 1908), pp. 33, 90, ill.
Badin, Jules. La manufacture de tapisseries de Beauvais depuis ses origines jusqu'à nos jours (Paris: Société de propagation des livres d'art, 1909), p. 105. Nolhac, Pierre de. François Boucher: Premier peintre du roi (Paris: Henri Floury, 1925), pp. 63-64. Borenius, Tancred. "The Michelham Collection." Apollo 4 (October 1926), p. 139. Hampton & Sons, London. 2nd Day's Sale. The Michelham Collection. Catalogue of Pictures [...]. November 24, 1926, p. 54, lot 287, ill.
Duveen and Co. A Catalogue of Works of Art in the Collection of Anna Thomson Dodge: Paintings, Tapestries, Furniture, and objets d'art. 2 vols. (Detroit: n.p., 1939), vol. 2, unpaginated, ill.
Townsend, Gertrude. "A Pastoral by François Boucher." Bulletin of the Museum of Fine Arts 38, no. 230 (December 1940), pp. 84-85. Wallace Collection Catalogues: Pictures and Drawings. 16th ed. (London: William Clowes and Sons Ltd., 1968), p. 30. Christie, Manson & Woods, London. Highly Important Pictures by Old Masters. June 25, 1971, p. 8, lot 4, ill.
La Coste-Messelière, M.-G. de. "Anatomie d'une vente publique." L'Oeil no. 197 (May 1971), pp. 27, 30-31, fig. 4. Fredericksen, Burton B. Catalogue of the Paintings in the J. Paul Getty Museum (Malibu: J. Paul Getty Museum, 1972), pp. 96-97, no. 130, ill.
Bordeaux, Jean-Luc. "The J. Paul Getty Museum: La peinture française." Connaissance des arts, no. 278 (April 1975), pp. 84, 86-87, fig. 6. Fredericksen, Burton B., ed. The J. Paul Getty Museum: Greek and Roman Antiquities, Western European Paintings, French Decorative Arts of the Eighteenth Century (Malibu: J. Paul Getty Museum, 1975), pp. 71, 126, ill.
Parker, John. Great Art Sales of the Century (London: Pitman Publishing, 1975), p. 80, pl. 6. Ananoff, Alexandre, and Daniel Wildenstein. François Boucher. 2 vols. (Lausanne: La bibliothèque des arts, 1976), vol. 2, pp. 16-17, no. 321a, fig. 919. Bordeaux, Jean-Luc. "The Epitome of the Pastoral Genre in Boucher's Oeuvre: The Fountain of Love and The Bird Catcher from The Noble Pastoral." The J. Paul Getty Museum Journal 3 (1976), pp. 75-101, figs. 1-4, 32. Fredericksen, Burton B., et al. Guidebook: The J. Paul Getty Museum. 3rd ed. (Malibu: J. Paul Getty Museum, 1976), p. 67. Standen, Edith A. "Some Notes on the Cartoons Used at the Gobelins and Beauvais Tapestry Manufactories in the Eighteenth Century." The J. Paul Getty Museum Journal 4 (1977), p. 27. Eitner, Lorenz. "Cages, Prisons, and Captives in Eighteenth-Century Art." In Images of Romanticism: Verbal and Visual Affinities. Karl Kroeber and William Walling, eds. (New Haven and London: Yale University Press, 1978), p. 16n5. Fredericksen, Burton B., Jiří Frel, and Gillian Wilson. Guidebook: The J. Paul Getty Museum. 4th ed. Sandra Morgan, ed. (Malibu: J. Paul Getty Museum, 1978), pp. 84, 86, ill.
Ananoff, Alexandre, and Daniel Wildenstein. L'opera completa di Boucher (Milan: Rizzoli, 1980), p. 112, fig. 333a. Fredericksen, Burton B. Masterpieces of Painting in the J. Paul Getty Museum (Malibu: J. Paul Getty Museum, 1980), unpaginated, no. 47, ill.
Fredericksen, Burton B., Jiří Frel, and Gillian Wilson. The J. Paul Getty Museum Guidebook. 5th ed. (Malibu: J. Paul Getty Museum, 1980), pp. 76-77, ill.
Black, Janet. 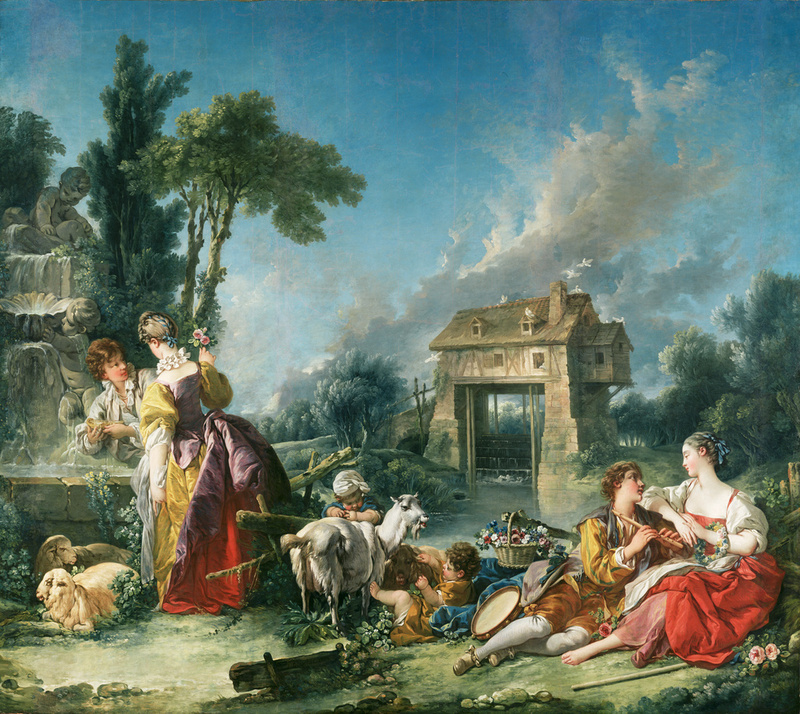 "Idyllic Landscape with a Woman Fishing : Nature and Sensibilité in the Art of Boucher." Perceptions: An Annual Publication of the Indianapolis Museum of Art 2 (1982), pp. 31-32, fig. 5. Carlson, Victor I., and John W. Ittmann, eds. Regency to Empire: French Printmaking, 1715-1814, exh. cat. (Baltimore: Baltimore Museum of Art, 1984), p. 256, under no. 89, entry by Victor Carlson. Bailey, Colin B., ed. The First Painters of the King: French Royal Taste from Louis XIV to the Revolution, exh. cat. (New York: Stair Sainty Matthiesen, 1985), p. 130, no. 38, ill.
Laing, Alastair, et al. François Boucher, 1703 -1770, exh. cat. (New York: Metropolitan Museum of Art, 1986), p. 282, under no. 69, fig. 182, entry by Alastair Laing. Französische Zeichnungen im Städelschen Kunstinstitut, 1550 bis 1800, exh. cat. (Frankfurt: Städtische Galerie im Städelschen Kunstinstitut, 1986), pp. 114-15, under no. 88, fig. 88a. Brunel, Georges. Boucher (Paris: Flammarion, 1986), p. 174. Standen, Edith A. "Boucher as a Tapestry Designer." In François Boucher, 1703-1770, exh. cat. (New York: The Metropolitan Museum of Art, 1986), p. 328. Laing, Alastair, et al. François Boucher 1703-1770, exh. Cat. (Paris: Réunion des musées nationaux, 1986), p. 284, under no. 69, fig. 182, entry by Alastair Laing. Bailey, Colin, et al. François Boucher: His Circle and Influence, exh. Cat. (New York: Stair Sainty Matthiesen, 1987), p. 55, under no. 31, p. 76, under no. 47, entry by Guy Stair Sainty. Ader Picard Tajan, Paris. Importants dessins et tableaux anciens. June 28, 1988, unpaginated, under lot 29. Hyde, Melissa. "Confounding Conventions: Gender Ambiguity and François Boucher's Painted Pastorals." Eighteenth-Century Studies 30, no. 1 (Fall 1996), p. 56, no. 64. Jaffé, David. Summary Catalogue of European Paintings in the J. Paul Getty Museum (Los Angeles: J. Paul Getty Museum, 1997), p. 13, ill.
Simon, Robert B. Figure and Fantasy in French Painting, 1650-1800, exh. cat. (New York: Berry-Hill Galleries, Inc., 1999), p. 34. Cornforth, John. London Interiors: From the Archives of Country Life (London: Aurum Press, 2000), p. 129, ill.
Secrest, Meryle. Duveen: A Life in Art (New York: Alfred A. Knopf, 2004), p. 205. The American Society for Eighteenth-Century Studies. Program of the 37th Annual Meeting, Montreal, Quebec (2006), ill. (front cover). A Guide to François Boucher in the Decorative Arts, visitor brochure (Los Angeles: J. Paul Getty Museum, 2006), unpaginated, ill.
Sheriff, Mary D. "Boucher's Enchanted Islands." In Rethinking Boucher. Melissa Hyde and Mark Ledbury, eds. (Los Angeles: Getty Research Institute, 2006), pp. 170, 190, pl. 13. Hall, Michael. "Bric-A-Brac: A Rothchild's Memoir of Collecting." Apollo 166, no. 545 (July-August 2007), pp. 58, 63n24. Brosens, Koenraad, ed. European Tapestries in the Art Institute of Chicago, exh. cat. (Chicago: The Art Institute of Chicago, with Yale University Press, 2008), pp. 286-87, 289. Tajan, Paris. Tableaux anciens et du XIXe siècle. June 23, 2009, p. 48, under lot 45.